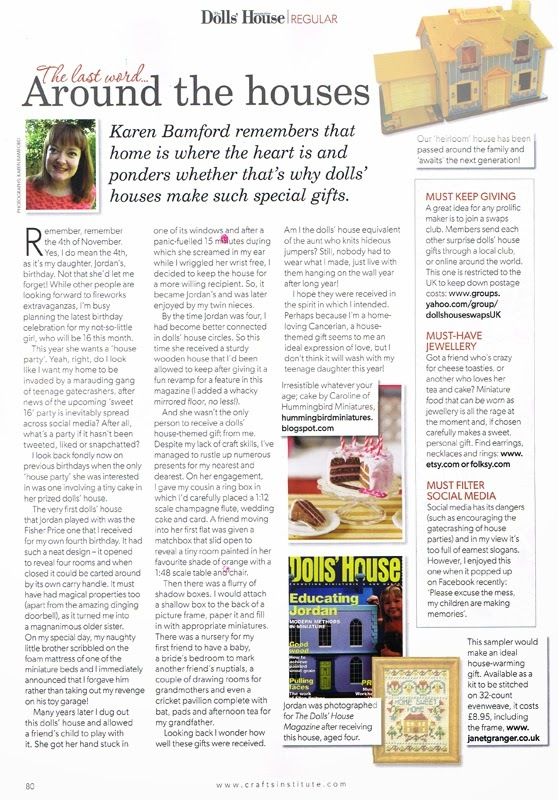 Cake in The Dolls House Magazine! 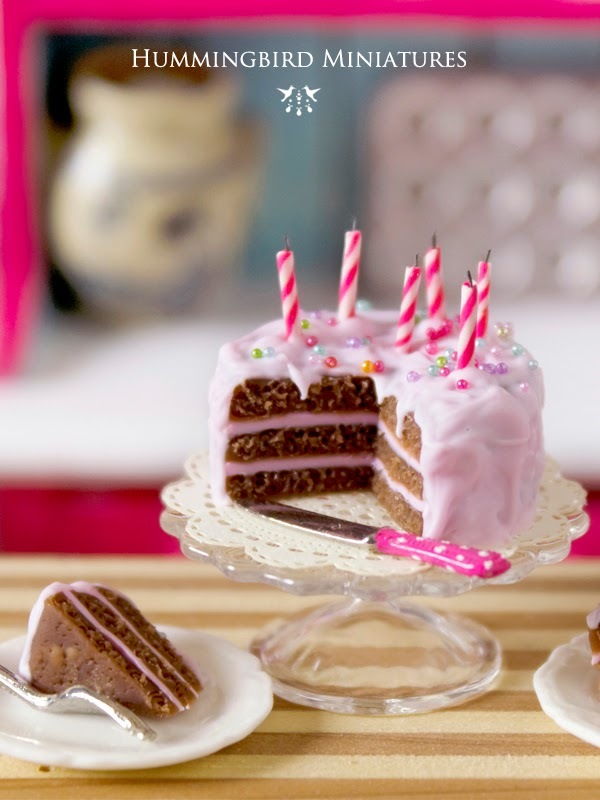 Was chuffed to see one of my new miniature birthday cakes in this month's issue of 'The Dolls House Magazine'! You can find your copy of this fantastic UK publication here. This is the cake they featured. Don't forget, I will be selling a whole new range of cakes over at my Hummingbird Miniatures online Etsy shop very soon, and until then I am selling them direct to customers who contact me by email. In other news.... you have just less than one day left to enter the competition that is currently running! It only takes a few clicks and you could be in with a chance of winning an original Hummingbird Miniatures Halloween miniature.... details here! Competition closes at midnight tonight (PST). 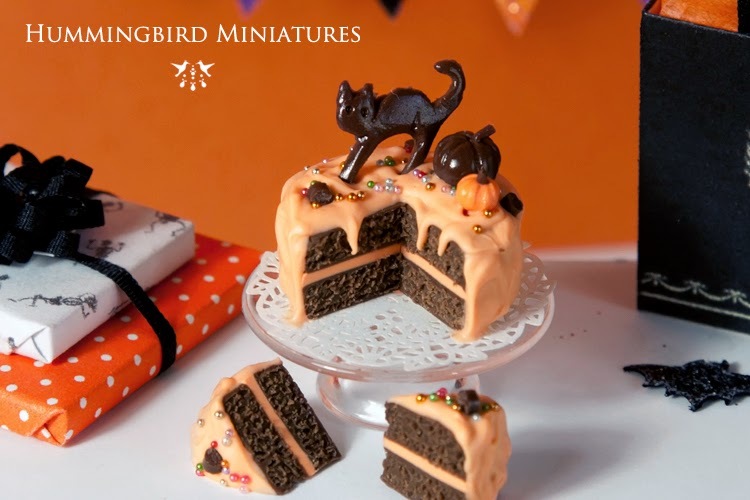 My three Halloween cakes have been available at my online Hummingbird Miniatures shop for 3-4 years now (I keep re-making them when they sell out), but I might be discontinuing these designs in order to create something new and different. 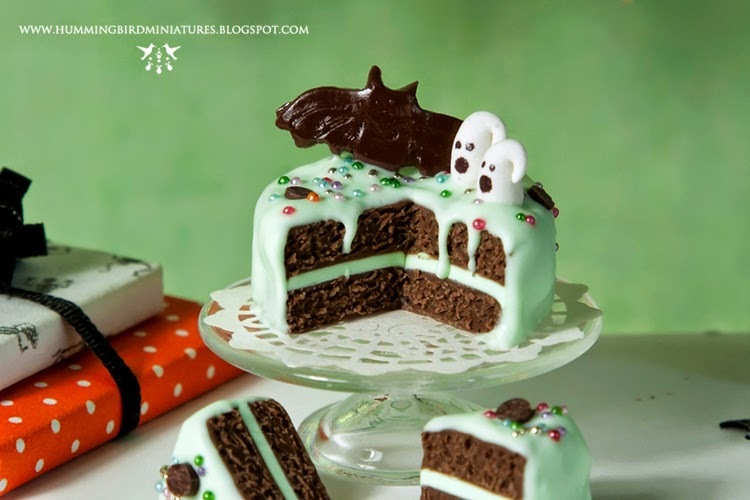 So if you really want the classic minty chocolate cake with bat, the orange chocolate cake with cat or the rich chocolate cake with spiderweb, then you might be running out of time! Don't forget, you may even be in with a chance at winning one of these cakes (or another Halloween item of your choosing) if you enter the competition which is currently running, and ENDS TOMORROW! Any questions, feel free to email me here. Good luck and stay tuned for Thanksgiving and Christmas here at Hummingbird Miniatures....! Don't you think it's about time I gave something away for free again?! It's been just over a year after all! 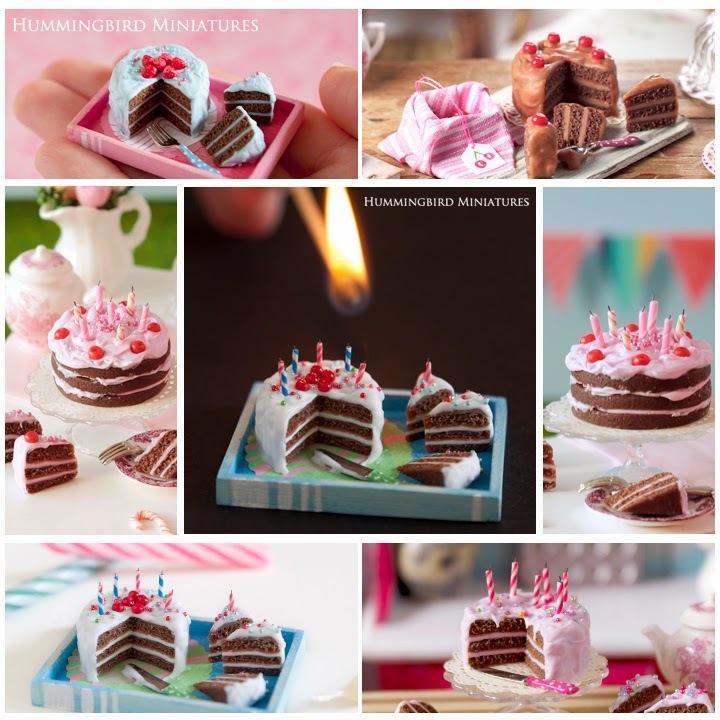 (See all past Hummingbird Miniatures competitions here). So... with Halloween coming up I thought it would be fun to offer up a gorgeous Halloween treat. 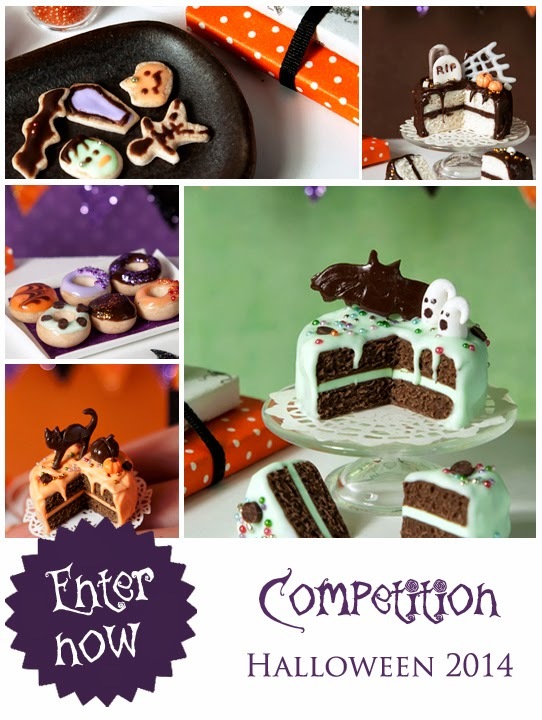 If you enter this competition you can choose from any of my Halloween treats which are currently available in the online Hummingbird Miniatures Etsy store (any of the three fabulously detailed cakes / donuts / donut tutorial / eclairs / cookies / Halloween religieuse pastries). My reasons for this new competition GIVE AWAY! I'd love to gain more interest in my company in LA - Tall Tales Productions, which creates content for film, TV and books. It's mostly in the form of miniatures (so I hope it interests you followers of Hummingbird Miniatures), and some illustration as well. It's easy! 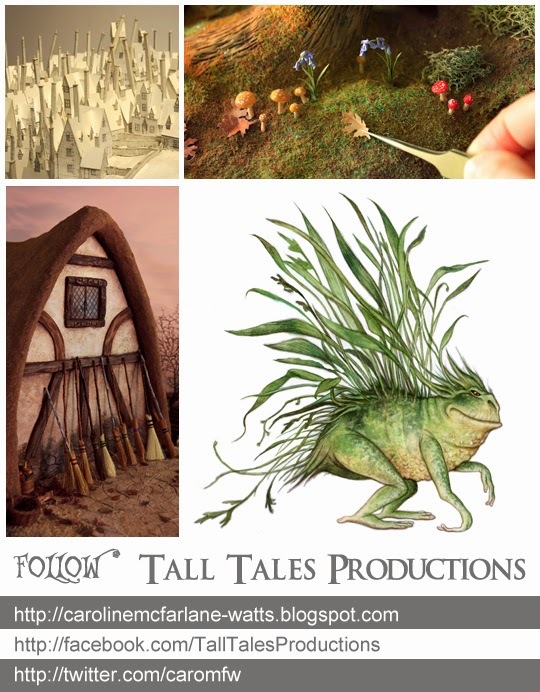 Just click to 'like' / 'follow' the three links for Tall Tales Productions. Once you have done that, just leave a comment ON THIS POST, let me know that you have liked the links, and say what you'd like to win (choose from the list above). See... told you it was easy! I will draw a name out of a hat in 10 day's time (Friday 17th) and this winner will have their chosen Halloween miniature sent to their address, free of charge. It doesn't matter where in the world you live -you can still enter. How to have a better chance of Winning! Share or direct people towards the Facebook page / blog / Twitter page and get them to 'like' as well, and I will enter your name twice. Get another friend to like, and I'll enter you a third time, and so forth. Leave me a comment on this blog post to let me know.